Home » indonesian food » Bamboes Rice Cooking "Rires Karonese Food"
Soak pulut in water overnight. Drain and mix with first-pressing coconut milk and a bit of salt. 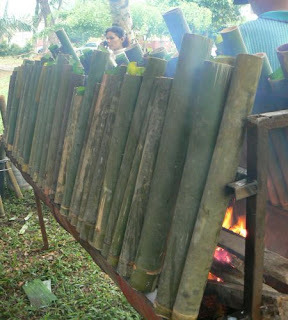 Insert the banana leaves into bamboo and fill the bamboo with the ­pulut. Do not compact the pulut. Tie banana leaves round open end of bamboo to seal it, and then cook the pulut by placing bamboo horizontally over a slow charcoal fire. After about 1/2 hour remove banana leaves round the open end of bamboo and, using the stem of the banana leaf, sprinkle more coconut milk. Re-cover open end and continue cooking the pulot over the charcoal fire until cooked. Cooking time takes about 1 to 1 1/2 hours.